AusNS2 Looking for New Moderator or Moderators! NS2 and more specifically the Australian community for NS2 have undergone many changes in their long lives, and it is time for more change in preparation for the upcoming year of NS2 within our community. While anyone can admit that NS2 may not be the game it once was, no one can argue that there is still much competition to be held and more room for improvement and consistency for events and community standards for AusNS2 community members and participants. Currently the AusNS2 admin team consists of myself, Taz and Zimoi and we have agreed that as a team we are no longer able to fully dedicate enough time to the game and the community due to real life commitments. We have decided that the best move from this point is to bolster our admin team to help carry out the next year of AusNS2 competitive events. The AusNS2 team are looking for 1 or 2 moderators to join the AusNS2 Admin Team. The selection process won't be incredibly formal just because we know pretty much everyone in the community and its silly to have a 'resume' or something similar for a gaming community. However, we just want to know how many people are interested in a role like this. If you have any other skills like video editing or graphic design that always helps as well! Any contribution is appreciated, while we would appreciate someone who is here to help for a while and become a member of the team, no hard feelings if this isn't for you. If you have any questions or are interested in becoming a moderator, either post here in the thread OR contact me privately on steam HERE. Thanks for taking the time to read this and stay tuned for more updates. December is upon us in what has felt like no time at all and we thought it would be good to recap on the amazing year it has been and bring you guys up to speed on what we have planned for the next few months. Before I get into that however, with great sadness we must inform you guys that bonage is stepping down from his role within the AusNS2 admin team. Bonage has been a crucial part of the team for well over a year and the community will not be the same without him at the helm. We wish him all the best! Be sure to thank him for all that he has done for the community in his thread or over steam, I'm sure he would appreciate the kind words! There will be no other changes to the current admin staff at this point in time and if you have any issues or inquiries at all, feel free to contact myself, Zimoi or Taz. Thank you to everyone that participated in the Christmas Draft Tournament, we had an amazing turnout of over 80 players from across Australia and North America! It is truly amazing to see the mumble server filled up with so many players at once! The results of the draft tournament can be found below or here at the challonge bracket page. Congratulations to Event Horizon for taking the win! Draft tournaments continue to be a success and are definitely something that you can expect to see more of later in 2015! 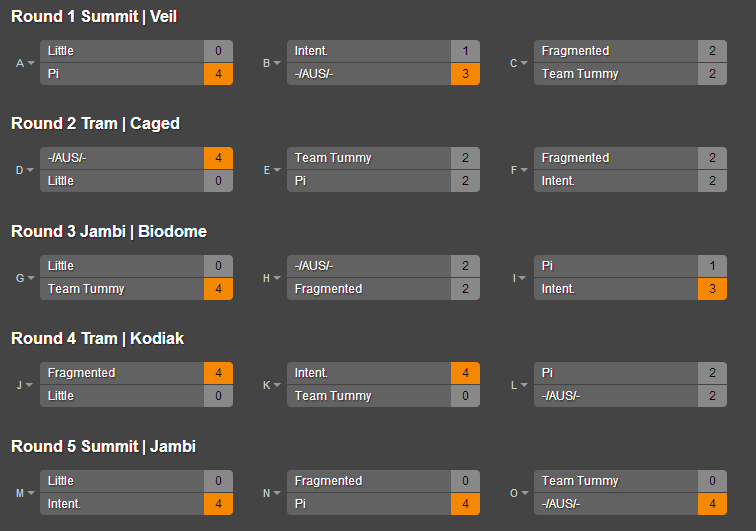 Again, thanks to all the participants in the AusNS2 League Season 3! There was a lot of improvement from many teams as well as some great competition which made to be a very entertaining season. Envy and Hungry Together tied at the top with 27 round wins and 5 round losses and Pi and the A team came a very close 3rd and 4th on 20 wins 12 losses and 19 wins and 13 losses respectively. These 4 teams all advanced to the semi finals with Envy knocking out the A team and Hungry Together knocking out Pi. The Bo7 Grand Final between Envy and Hungry Together was played last weekend and if you would like to watch it head to the links below! Thanks to Brad for the recordings! The top 3 teams will be receiving the appropriate forum badges relatively shortly! The first proposed tournament is a joint effort between the NSL and AusNS2, the Pacific Cup! Open to NA and AU teams! We will have some more information on this tournament coming shortly, if this is something you would like to participate in. If we do not get enough interest from either side of the pond, this tournament will more than likely not happen. So make sure you let me know either in this thread or over steam if you would like to see us go through with this! At this stage its just an idea but we would love to see it happen! The second proposed tournament is just for us Australians! Here is the idea: A tournament built around teams that consist of players all from the same state. A interstate all star match essentially. If states don't have enough players to form a full team, they will be merged with another state and will represent those territories together! New Zealand also counts as a state for the purpose of this tournament. Again, if you guys would like to see this happen, let us know. Personally, I'm excited for this tournament so I would love to see it through. The timeline for these tournaments are yet to be confirmed but ideally we are aiming for the end of January and beginning of February! Anyways, a long update for you guys, but to wrap up, the AusNS2 Admin Team would like to wish you a Merry Christmas and a Happy New Year! Make sure to stay safe over the holiday break and we will be back with more NS2 action when everyone returns! AusNS2 has put together a West Coast Server for everyone to use. As teams from Australia start to play in NSL matches and scrim overseas teams, it's become increasingly apparent that we need a decent stable server with the best pings possible to play Americans and Europeans on. This server will be used primarily to facilitate those teams. This server will also play a part in our plans to expand future specialised tournaments to include international teams. Expect more on that to come after this season of the league has finished. if you have any issues with the server, please contact bonage. So a few of you have noticed the amazing new achievements being displayed below users avatars on the forums. The competitive achievements are given to the 1st, 2nd and 3rd place winners of any competition run by AusNS2. This will include the upcoming draft tournament, and league season 2. Community Spirit achievements are awarded to community members who go above and beyond to help progress the community. This could include organising PUGS, writing guides, helping out newbies, helping out with competitions etc. We welcome anyone who wants to nominate another person for this achievement. The design of this achievement icon is still in progress. And finally the donation achievement is fairly self explanatory. If you donate money towards the site within any of the following brackets, you will be awarded the equivalent achievement. Any money donated towards the site will go 100% towards the running of the community and any costs associated with that. You can view the full list of achievements at this handy page here. If you have any questions, or maybe additional badge ideas, feel free to post them below!